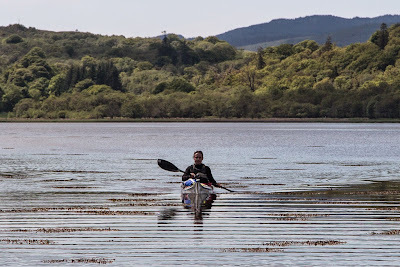 It was almost high water and we were able to paddle very near to the head of West Loch Tarbert. High water in West Loch Tarbert is very variable as it opens into the sea in an area affected by an amphidrome. As a very rough guide, local HW is -0200 HW Oban at springs and -0500 HW Oban at neaps. This means that the tide is approximately 26 minutes earlier each day between springs and neaps. 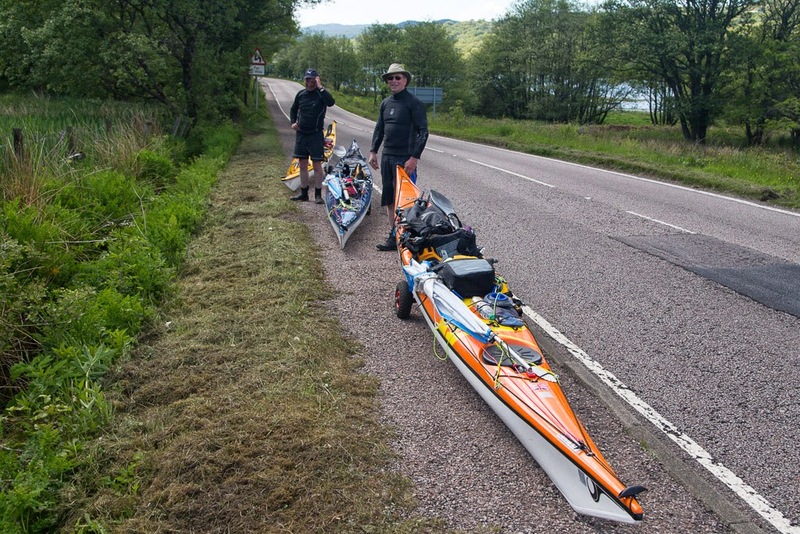 We were 4 days before springs and HW Oban was 17:18 so local HW in West Loch Tarbert was 17:18-(02:00+01:43) = 13:35. We arrived at 13:35 and the tide was indeed just turning. We found ourselves close to the road but a surprisingly steep bank rose up from the high water mark. To get there we had to wade through particularly soft and sticky mud. Then we discovered the "grassy" bank was actually a thicket of nettles and brambles. It took four of us to man handle each loaded kayak diagonally up the slope. 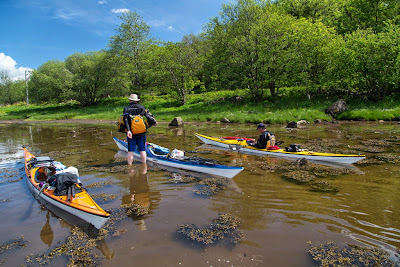 In the 30 minutes it took to get the kayaks to the road, the tide had disappeared, leaving a huge expanse of oozing mud. My advice for this portage is to exit 1km further back down the loch at the slipway by West Tarbert pier. The summit of the 1.6km portage is 22m above sea level and it was on this slope that I realised I would need to see a surgeon for my sore left shoulder. 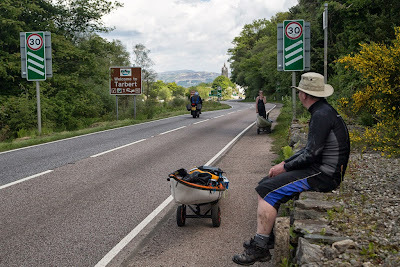 It was a great relief to start the descent into Tarbert and the Firth of Clyde. We certainly would not be breaking any speed limits as we were averaging just 2.2km/hr. On seeing Tarbert harbour, Jennifer said "Oh no the tide is out!" An old fisherman, who was interested in our story, said "Aye, when the tide is in at the west loch it is oot at the east loch. If ye dinna ken afore, ye ken the noo!" We spent 35 minutes resupplying in the local Co-op supermarket and eating an ice cream. 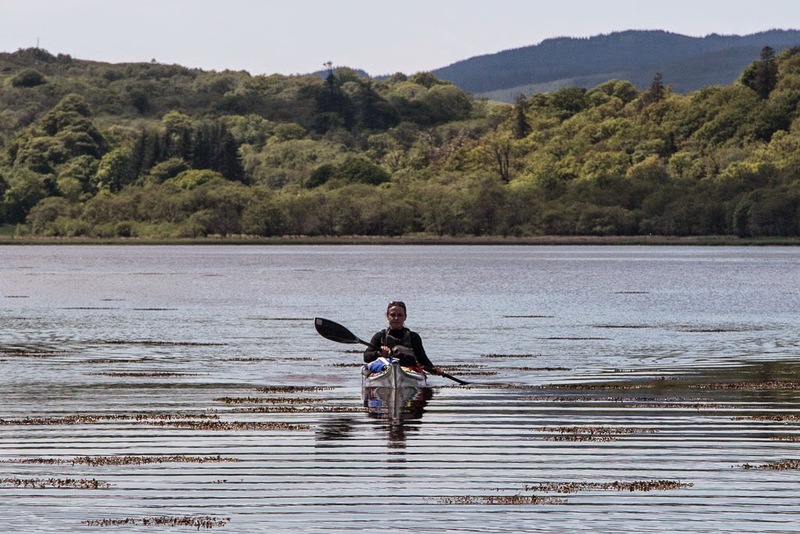 The tidal constant between West Loch Tarbert and East Loch Tarbert (which is a recognised secondary tidal port with tide tables freely available) is approximately +1 hour neaps and +3.5hours springs. HW in East Loch Tarbert was actually at 11:53 and by the time we launched it was 15:44, nearly 4 hours after HW. 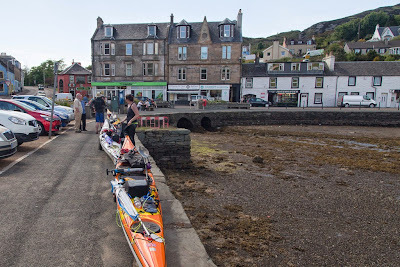 Fortunately the bottom of Tarbert harbour was firm enough for our trolley wheels but if the tide had dropped much further then it would have been soft mud. Not counting the 35 minutes shopping, the total portage from afloat to afloat had taken 2 hours and 9 minutes. 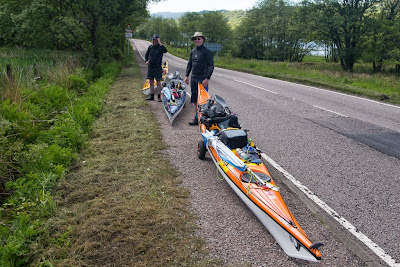 Given our 30 minute struggle to get the boats up the bank from the head of the loch, it would probably have taken the same time to have trollyed the kayaks the extra 1km from the West Tarbert slipway and its easier exit. There are many places in Scotland called Tarbert or Tarbet. The name comes from the Gaelic word Tairbeart. In modern Gaelic this means isthmus but its origin lies in "over carry" or "draw boat". Of course sea kayakers were not the first to portage their boats over the isthmus at Tarbert. In about 1093 Magnus Barefoot, King of Norway, had made a truce with the King of Scotland that allowed him to claim possession of any land he could "sail" round. 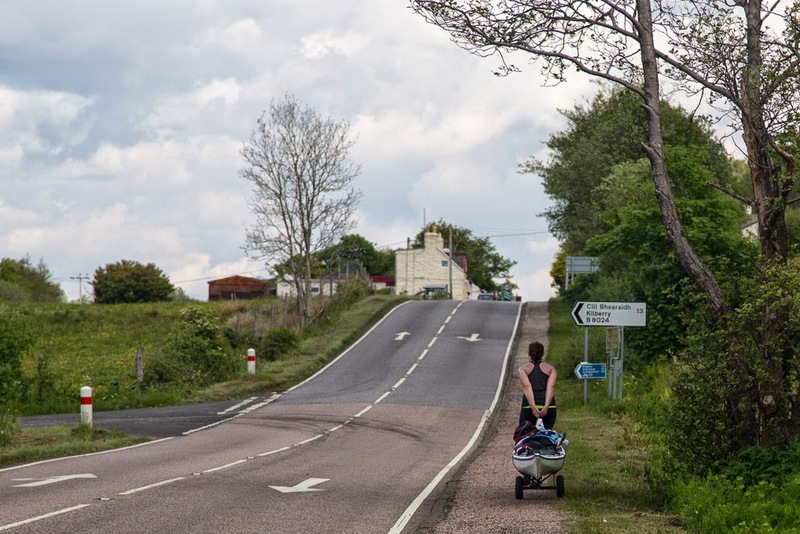 Of course he didn't necessarily use his own Vikings as labour, he probably "recruited" the unfortunate locals.Unlike the Vikings, we had come unarmed and so had to draw our own boats across the isthmus but we were now back in the Firth of Clyde.